Both China and India have attracted global attention for rapid growth, but their growth patterns are very different (Rajan 2006, Pack 2008, Bosworth and Maertens 2010). China took the conventional route of manufacturing-led growth and is recognised as a global leader in manufactured exports. India followed the unconventional route of service-led growth and has acquired a global reputation for service exports. Are their growth patterns converging? Is China catching up in services? Is India catching up in manufacturing? Or has hysteresis kept their growth patterns different? China’s Tenth Five Year Plan (2001-2005) called for greater efforts to develop the service sector. India’s Tenth Five Year Plan (2003-2007) emphasised the importance of doubling the growth rate in the manufacturing sector. Policymakers in both countries have taken proactive measures to develop their underdeveloped sectors. In the post-crisis global economy, countries have started to rebalance their growth strategies, to reduce export fetish and to reduce global imbalances. 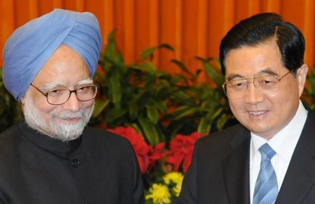 For China, this has meant developing the service sector, and for India, developing its manufacturing sector. We examine whether India remains an outlier in services, and China in manufacturing, by regressing the relative share of service and manufacturing sectors in GDP on the level of per capita income, after controlling for non-linearities in development and country size. There is no evidence of growth convergence. In 1991, India’s share of service sector in GDP was five percentage points above the global norm, controlling for other factors (Table 1). China’s share was six percentage points below the global norm. By 2005, India had become a slightly larger positive outlier compared to the global norm, while China had become an even larger negative outlier – China’s relative share of services was nearly eight percentage points below the global norm. So services have continued to be a more important sector for India, and less important for China, controlling for other things. What about the manufacturing sector? In 1991, China was a large positive outlier in manufacturing – its manufacturing share in GDP was 18 percentage points above the global norm. India’s share was three percentage points above the global norm. In 2005, China’s share of manufacturing in GDP was 19 percentage points above the global norm. India’s relative share of manufacturing had not changed much. Notes: Robust standard errors are reported in paranthesis. *** represents significance at 1%, ** at 5%, and * at 10%. The competiveness of a sector may be associated with its size. A large sector may enable many more firms to take advantage of scale economies, knowledge spillovers, and better risk management. These, in turn, can increase productivity and make more firms competitive globally. Is the service sector more productive in India than in China, and the manufacturing sector more productive in China compared to India? Figure 1 compares service labour productivity and industry labour productivity for a large sample of countries, after controlling for initial GDP per capita and GDP growth. India is way above the line. It shows much higher labour productivity in the service sector compared to industry. On the other hand, China shows much higher labour productivity in industry compared to services. Note: The vertical axis is growth in service labour productivity after controlling for initial income per capita and GDP growth whereas the horizontal axis is industrial labour. There are two tipping points that are driving higher service labour–productivity growth rates. First, low-income countries that have the benefit of low wage rates, scale economies, and knowledge spillovers, like India, are catching up with the global production possibility frontier in services. In essence, the service sector in India has behaved like the manufacturing sector in China. Second, high-income countries like Singapore, Sweden, the UK, and the US, are pushing the global production possibility frontier in services through innovation. Are the export patterns of China and India converging? Table 2 reports cross-country regression results for the share of total service exports in total exports of goods and services, and the share of modern service exports (IT and IT-enabled service exports) in total exports. In 1982, the shares of service exports in total exports for China and India were not significantly different from the global norm. Only the US had a significant positive coefficient. Its relative share of service exports was 20 percentage points above the global norm. In 2006, India was a significant and large positive outlier. Its share of service exports in total exports was nearly 21 percentage points greater than the norm. China’s coefficient was not significantly different from zero. The US’ share was more than 31 percentage points above the global norm, controlling for other factors. 1%, ** at 5%, and * at 10%. China is doing well in traditional services which are closely related to the manufacturing sector, like transport and logistics. While India has performed poorly in traditional services, it has succeeded in becoming a global leader in modern services that can be transported through the internet. A good proxy for modern service exports is IT and IT-enabled services, cross-country data for which is available only from 2000 onwards. Table 2 shows that India stood out as a significant and positive outlier when we compare its share of IT and IT-enabled exports in total exports of goods and services with the rest of the world. Its share of modern service exports was nearly eight percentage points above the global norm after controlling for other factors. The relative share of modern services in total exports from China was not significantly different from the global norm. With the right policies, India can grow as fast as China, if not faster. There is as much scope for catching up through productivity growth in services as there is in manufacturing. Globalisation of services is the tip of the iceberg (Blinder 2006). But India can ill afford to be a single trick pony. Services are more skill intensive compared to manufacturing, and so it creates fewer jobs. India now needs to develop its manufacturing sector to create jobs for the millions of additional workers who will join the labour force every year for the next two decades. China, on the other hand, needs to develop services and go up the value chain, from less skill-intensive to more skill-intensive activities. Developing services will enable China to avoid the inevitable middle-income trap, which is more difficult to avoid if it just relies on manufacturing as a source of growth. There is enough room for India to use manufacturing as a growth escalator, and for China to tap into services as a growth escalator. Author’s note: This article is based on the work in Service Revolution. The views expressed here are those of the author and not the World Bank. Bosworth, Barry and Annemie Maertens (2010), “Economic Growth and Employment Generation: The Role of the Service Sector”, in E Ghani (ed. ), The Service Revolution in South Asia, Oxford University Press. Desmet, Klau and Esteban Rossi-Hansberg (2007), “Spatial Growth of employment in “young” services sector mirroring that of early 20th century manufacturing”, VoxEU.org, 13 August. Ghani, Ejaz (2010), “Is Service Led Growth a Miracle for South Asia”, in E Ghani (ed. ), The Service Revolution in South Asia, Oxford University Press. Rajan, Raghuram, G (2006), “India: The Past and the Future”, Asian Development Review, 23(2):36-52. Pack, Howard (2008), “Should South Asia Emulate East Asian Tigers?”, in E Ghani and Sadiq Ahmed (eds. ), Accelerating Growth and Creating Jobs in South Asia, Oxford University Press. Ejaz Ghani, an Indian national, is currently Economic Advisor at The World Bank. He has worked on Africa, East Asia, and India/South Asia. He has written on poverty, growth, trade, fiscal policy, debt management, conflict, decentralization, entrepreneurship, employment, and agriculture. He has been a consultant at ILO, UNCTAD, and UNICEF. He has edited several books including Reshaping Tomorrow–Is South Asia Ready for the Big Leap? Oxford University Press 2011; The Poor Half Billion in South Asia, Oxford University Press 2010; The Service Revolution in South Asia, Oxford University Press 2010; Accelerating Growth and Job Creation in South Asia (with S. Ahmed) 2009, Promoting Economic Cooperation in South Asia (with S. Ahmed and S. Kelegama), 2009; and Growth and Regional Integration (with S. Ahmed) Macmillan 2007. He has taught economics at Delhi University (India) and Oxford University (U.K.). He is an Inlaks Scholar, and obtained an M. Phil. & D. Phil in Economics from Oxford University. He did his schooling in Bihar at St. Michael’s High school Patna; undergraduate degree at St. Stephens College; and Masters degree at Jawaharlal Nehru University.